I have a concern about a number of websites that offers a booking service for the Driver Theory and Practical tests on the island of Ireland. This website has a high “Ad word” ranking on Internet search engines (Google etc.) and can be found at the top in the advertised sites relating to RSA searches. These sites are charging an additional commission of €18 to €25 per test. The driving test fee that you should be paying is set by the Minister for Transport at €85. 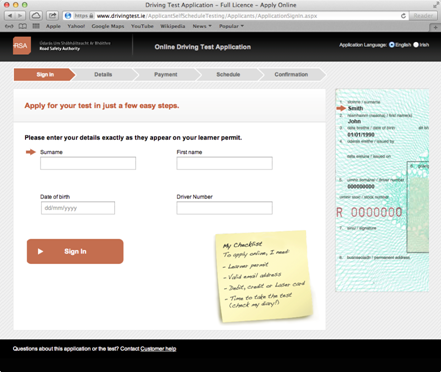 Only book your driving test through the official RSA website links available on the bottom of our home page. The Official site is shown below. The R.S.A. have initiated measures to limit the ability of these sites but ask that you advise you not to use these service providers. The RSA official site is quicker and easier to use and allows test date and time selection in certain test centres. So has it made any difference? Depending on who you talk to, the opinions are very mixed. Before EDT was introduced, driving instructors found it very hard to keep students with them until all lessons of the road had been learnt. The thought process for most people who I have experienced would have been to learn how to control the car and the rest will come naturally. This meant that there are a lot of people out there who can control a car and turn the wheel but have no idea what a potential hazard looks like, and how to react when they see one. Thus the reason that accidents are happening morning noon and night. So How has EDT helped? EDT has now enabled driving instructors to keep their students in for the long term. We can now not only teach them how to control the car, for example, starting the car, moving the car forward, stopping the car safely, steering or turning the car and changing gear, but it now allows us to guarantee a varied range of different driving situations. What I mean is, the most common and the least common causes of an accident can now be given as tuition before they book their driving test. This is making for a much safer driver and further increases your chances of passing FIRST time. I recently had a student who had taken their driving test 6 times. Each time failing for different elements of driving. They told me they had 2 driving lessons when they were younger and had been driving around on a Learner Permit ever since (just the people who the RSA are targeting). We agreed on 5 Driving Lessons and set about fixing the errors that had previously failed them. All the time using EDT as a check list. After 3 lessons they had noticed a considerable difference in their awareness and was starting to take note of things going on around them. Needless to say they went on to pass their test and now salutes me when ever we meet on the road. I have peace of mind that they are less of a danger on the road. In Terms of EDT. This is being done from the start now. So No driving around for long periods on learner permits and getting into trouble. Sometimes learning by your mistakes can come at a price. I don’t really need to tell you all what the highest price is that you could pay on the road. For those of you who are currently in the middle of EDT Essential Driver training….keep it up and stick at it. For those of you still on a learner permit or provisional, and want to get the best of a full licence, then give me or any other approved driving instructor a call and get in some EDT essential driver training today.